Major disruptions to the WordPress.org network are being published on a new website announced last week. The new blog provides updates when parts of WordPress.org are offline. Lead core developer Andrew Nacin posted at Make WordPress Core that status.wordpress.org has been set up provide public updates regarding issues with the network. The site is hosted outside the WordPress.org environment at WordPress.com and gives users a place to go if they’re experiencing problems accessing parts of the site and want to know what’s going on. The new site comes after problems with the support forums last Thursday. 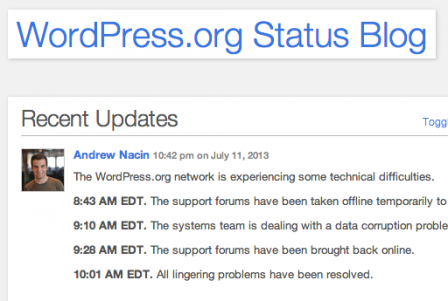 In his post, Nacin said the forums were taken offline to help resolve data corruption and uptime issues with a database cluster, which had caused intermittent downtime across the WordPress.org network. The site was back up and running again less than an hour later. Check out status.wordpress.org for updates or to subscribe to future posts.